If this card is any guide, Larry Parrish did not enjoy fielding. 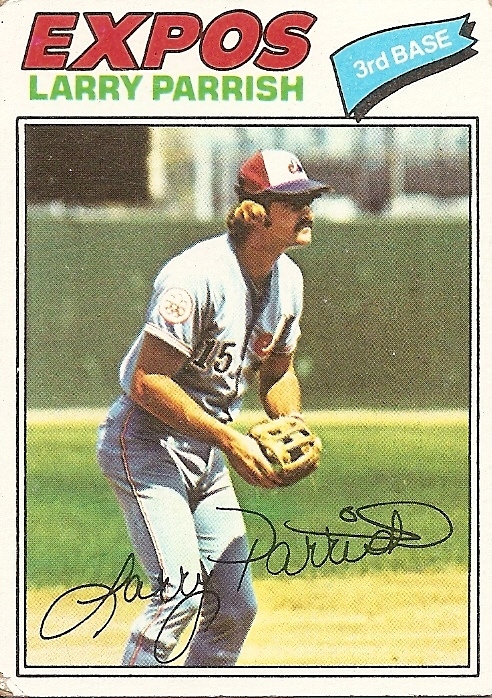 Compare his posture in this 1977 card to the previous card featured on this site. While Keith Hernandez seems as if he can’t wait to strangle the life out of the opposition’s run-scoring attempts, Larry Parrish exudes a stolid, lantern-jawed apprehension and confusion. He seems to have a dim understanding that he’s about to be baffled, frustrated, stung. Probably nothing will happen next. That’s the torturous part. Most of the time the ball isn’t even put into play, and if it is it likely won’t be hit to you. You wait, brace yourself, get nothing, wait some more. Then when something finally does come your way it happens too fast. You stand there rubbing the bruise and watching it bound away, past you already, already part of the past. Larry Parrish had a strong arm. There’s something in his posture here that speaks to that asset. If I can only get my hands on the thing, I can do good. In fact, he did do good. Several years in the league, some very good seasons with the bat, if not the glove. The best years were in a foreign land, with an up and coming team that never quite arrived. From there he went to the Rangers, where many a cement-legged slugger has gone to bash line drives into the sweltering, futile Texas summer. In 1988, his final season, he joined the Red Sox, which I don’t recall, even though that’s my team and that year they won the division. I had a sociology class the day of the first game of the playoffs, and I remember racing up the hill after class to get to a television. My memory and the Red Sox’ extremely quick exit from the playoffs that season collapse that moment of racing up the hill to stand for my entire experience of that year’s dashed dream of baseball joy: I ran up the hill but by the time I got anywhere Wade Boggs was fanning on a pitch from the Eck and the season was over. This isn’t actually what happened, of course, but it’s how I remember it now. That’s how I remember everything. I was always trying to get my hands on something. It was always by me before I could grab hold. You are currently browsing the archives for the Larry Parrish category.